I found this recipe awhile ago thinking it sounded like a tasty and healthy (minus the heavy cream) meatless meal, aka – something M wouldn’t eat. I think roasted chicken would be a good addition to this and even some peas – you can’t go wrong with peas and carrots now, can you? In my opinion, you can go wrong with too much garlic! Woo – does my breath reek of it! If you plan on making this one and raw garlic’s spiciness isn’t too much for you, then add it all, baby! ;o) I only added four of the five and I’ve learned my lesson – I forgot that raw garlic can seem spicy, but it’s also much more potent when it’s not cooked. I recommend maybe adding one or two cloves instead of the recommended five. Other than that, this pasta has a nice flavor – nothing spectacular, but it’s tasty. I added some ketchup (gasp) for its sweetness to cut some of the garlic flavor which made it much easier to eat. Thanks for reading, enjoy! 1. Preheat oven to 400 degrees. In a large bowl toss the carrot rounds and garlic with the Olive oil, using your hand to thoroughly coat the carrots and garlic with oil. Season well with salt, pepper, and thyme. 2. Bake in a 9×13 inch baking pan about 45-50 minutes until carrots are tender. Take the pan out and toss halfway through the cooking time. 4. In a blender or food processor puree the carrots and garlic together with the heavy cream and Parmesan cheese. When the pasta is done cooking reserve a cup and a half of the pasta water. 5. Drain pasta and add to a large mixing bowl. 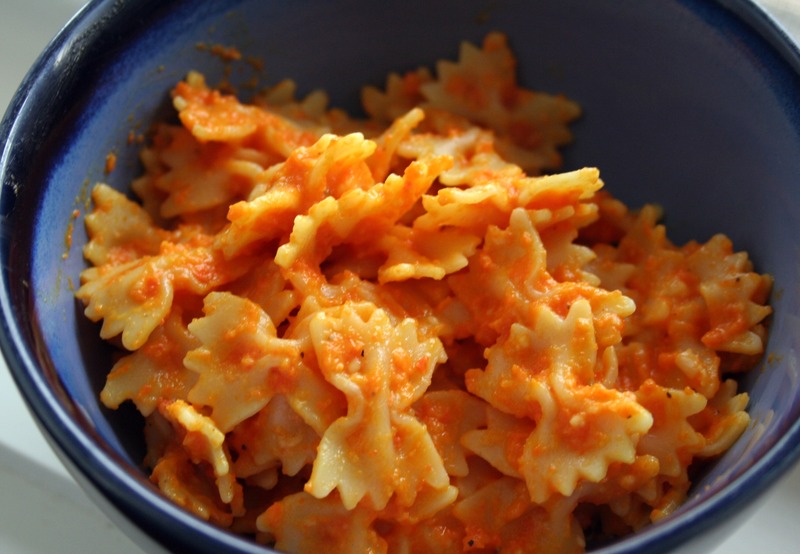 Toss with carrot cream, adding pasta water a little at a time until you get a nice consistency and the pasta is evenly coated. 6. Serve with Parmesan and crusty bread/garlic bread.